Born at Damascus, about 676; died some time between 754 and 787. Mansur was probably the name of John’s father. What little is known of Mansur indicates that he was a sterling Christian whose infidel environment made no impression on his religious fervour. Apparently his adhesion to Christian truth constituted no offence in the eyes of his Saracen countrymen, for he seems to have enjoyed their esteem in an eminent degree, and discharged the duties of chief financial officer for the caliph, Abdul Malek. Mansur begot at least two children, John and his half-brother Cosmas. When the future apologist had reached the age of twenty-three his father cast about for a Christian tutor capable of giving his sons the best education the age afforded. In this he was singularly fortunate. Standing one day in the market-place he discovered among the captives taken in a recent raid on the shores of Italy a Sicilian monk named Cosmas. Investigation proved him to be a man of deep and broad erudition. Through the influence of the caliph, Mansur secured the captive’s liberty and appointed him tutor to his sons. Under the tutelage of Cosmas, John made such rapid progress that, in the enthusiastic language of his biographer, he soon equalled Diophantus in algebra and Euclid in geometry. Equal progress was made in music, astronomy, and theology. On the death of his father, John Damascene was made protosymbulus, or chief councillor, of Damascus. It was during his incumbency of this office that the Church in the East began to be agitated by the first mutterings of the Iconoclast heresy. In 726, despite the protests of Germanus, Patriarch of Constantinople, Emperor Leo the Isaurian issued his first edict against the veneration of images. 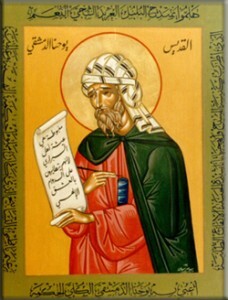 From his secure refuge in the caliph’s court, John Damascene immediately entered the lists against him, in defense of this ancient usage of the Christians. Not only did he himself oppose the Byzantine monarch, but he also stirred the people to resistance. In 730 the Isaurian issued a second edict, in which he not only forbade the veneration of images, but even inhibited their exhibition in public places. To this royal decree the Damascene replied with even greater vigour than before, and by the adoption of a simpler style brought the Christian side of the controversy within the grasp of the common people. A third letter emphasized what he had already said and warned the emperor to beware of the consequences of this unlawful action. Naturally, these powerful apologies aroused the anger of the Byzantine emperor. Unable to reach the writer with physical force, he sought to encompass his destruction by strategy. Having secured an autograph letter written by John Damascene, he forged a letter, exactly similar in chirography, purporting to have been written by John to the Isaurian, and offering to betray into his hands the city of Damascus. The letter he sent to the caliph. Notwithstanding his councillor’s earnest avowal of innocence, the latter accepted it as genuine and ordered that the hand that wrote it be severed at the wrist. The sentence was executed, but, according to his biographer, through the intervention of the Blessed Virgin, the amputated hand was miraculously restored. John of Damascus was the last of the Greek Fathers. His genius was not for original theological development, but for compilation of an encyclopedic character. In fact, the state of full development to which theological thought had been brought by the great Greek writers and councils left him little else than the work of an encyclopedist; and this work he performed in such manner as to merit the gratitude of all succeeding ages.